As we entered fall 2018, we made a couple of tweaks to this sub-$500 article to reflect a few price changes. Leaving us were the ADAM Audio F5 and JBL LSR308, making room for two excellent speakers – the ADAM A5X and the Mackie HR624mk2. These days, with $500 to spend, you can pick up an epic studio monitoring speaker that offers near pro-grade quality at a price that doesn’t bankrupt you. While we’re still a little way off high-end, you can still find some of the best monitor speakers for smaller studios in this segment of the market. In this article – newly updated for 2018 – we have highlighted some of the best monitoring speakers under $500, as well as offered you the lowdown on what to expect in terms of hardware and performance. Let’s get started! Lightning quick hybrid ribbon tweeter paired with top-tier hardware and smart design. Great hardware combined with smart waveguide design and powerful set of amps. The largest member of the Eris family, bringing great performance and transparency. Compact set that delivers plenty of headroom and a pretty flat response. Excellent mid-range monitoring speaker for when space is tight. ADAM Audio's monitors were always regarded as some of the best on the market. With the release of A5X, that reputation has only been reinforced. This speaker comes with their popular X-Art tweeter capable of reaching 50kHz, a completely redesigned set of front firing ports, a new carbon fiber based driver and so much more. When you put it all together, you are getting an incredibly flat response and performance that makes the A5X sound way bigger than it actually is. This monitor is a perfect solution for smaller studios, but it will work flawlessly even in a larger space. With plenty of power and volume, you are looking at a very efficient set of monitors speakers. 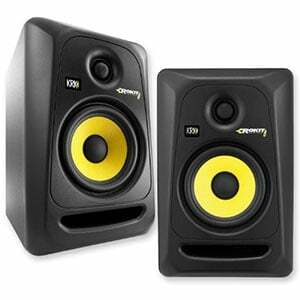 KRK's Rokit series of studio monitors have been the dominating the affordable segment of the market for quite some time. The latest generation of this lineup promises to do the same. Rokit 8 Gen 3 has proven to be a worthy successor. It is the second largest monitor in the series, packing a mighty 8" Aramid-glass low-frequency driver and a very efficient 1" tweeter. A set of these delivers 100 Watts of juice, allowing them to hit 109 dB of peak max SPL at 1 meter. That means you will have more than plenty of headroom in near field configuration. 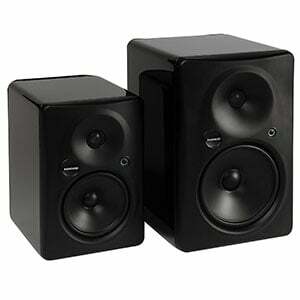 Flat and responsive, these speakers are a great choice for budget studio builds. 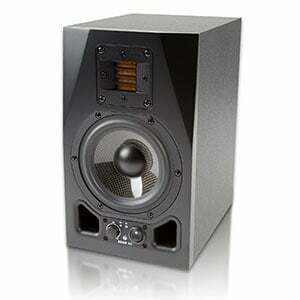 PreSonus Eris E8 represents a very successful attempt on their part to enter the studio monitor market. This speaker packs all the right features in all the right places. On top of that, its massive 8" low-frequency drivers are capable of moving some serious air. However, it is important to note that the low end is impressively tight and articulated. The response across the range inspires confidence. There is an abundance of transparency with no bias even in the upper end of the range. Lastly, PreSonus has included very detailed acoustic controls, which allow the user to really tailor the performance of these speakers to their studio's layout. Overall, this speaker simply delivers. 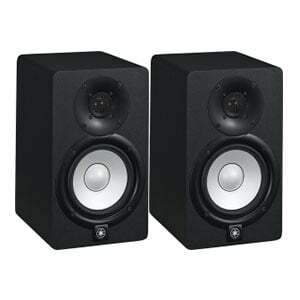 Yamaha HS5 belongs to the ever so popular HS series of studio monitors. Even though it is more compact than what many other brands offer in this price range, Yamaha HS5 brings that solid performance which makes it a great tool to have in smaller studios. As a matter of fact, it was built to accommodate for the lack of space. Hardware is bulletproof, while its build quality is hard to beat. What seals the deal is the level of transparency you can count on. The response is flat, linear and more than good enough for serious applications. Overall, it is fair to say that Yamaha HS5 still remains very much relevant in this segment of the market. With the mk2, Mackie has taken the popular HR624 and improved it inside and out! With a build that’s very close to the higher-end HR824mk2, the HR624mk2 features a compact construction, with a very sophisticated design. The cab is made of MDF while the Zero Edge Baffle is crafted from a single piece of aluminum, housing a 6.7” high-precision low-frequency transducer and a 1” titanium dome tweeter. The HR624mk2 offers several smart features, including advanced Acoustic Space Controls, making this model a solid choice for smaller studios where space is tight. Check out the full review for an in-depth look at the Mackie HR624mk2. If you have more than a passing interest in mixing, monitoring or critical listening of any kind, investing in studio monitors is always a good move. As these speakers are your only real point of contact with the music you are mixing or recording, you will want something with exceptional accuracy and clarity. With this in mind, where do we draw the line when it comes to price? Are $300 monitors good enough? What about budget models that come in under $100? Ultimately, having any kind of monitors is preferable to having none at all, so if all you can afford is budget monitors, then go for it! However, in general, the more expensive the model, the better the performance. To answer the question, there are four areas where a $500 set of studio monitors offers an advantage over their cheaper counterparts. Here you are looking at more real estate in terms of low-frequency drivers – and with bigger drivers comes more power. As almost all monitors are near-field in nature, many will wonder if all that extra power is even necessary. But it does make sense – having more power means that you have a lot more headroom, where you can push the mix louder without the speakers suffering distortion. On a similar note, having larger low-frequency drivers means your bass response will be much tighter. These benefits alone make the investment worth it. One of the next big differences between speakers in this range and more budget-friendly options is the level of overall performance. With $500 comes increased transparency across a much wider frequency range, as well as better handling of the lower end and less distortion when the speaker is pushed out of its comfort zone. Contrary to what some people may think, having transparency in your sound does not mean a lack of bass. Having proper low-end handling – as these $500 speakers do – will mean that the speaker is capable of reproducing bass frequencies, but without them sounding muddy. The practical implications of having more refined monitors are simple. You will have much more control over your mix so even the subtlest imperfections will stand out clearly enough for you to pick them up. One of the most overlooked aspects when it comes to audio gear – studio monitors included – is versatility. A proper recording studio, even a smaller one, will include a myriad of mixers, instruments and other equipment. That’s why having a set of monitors with a versatile I/O cluster is necessary. The good news is that, models in this price range will offer that. You can count on seeing 1/4″ TRS jacks and XLR ports at the very least, while some will feature RCA inputs as well as wireless connections via Bluetooth. Another measure of versatility is the acoustic controls department. These controls allow you to adjust the speaker’s output to match the size and shape of your studio. For example, good acoustic room controls will allow you the optimum sound regardless of whether your speaker is in the middle of the room or next to a wall. Despite being simple wooden boxes, speaker cabinets have a lot of impact on how the speaker performs and sounds. As you enter the $500 segment of the market, you will begin to see some pretty advanced speaker cabinet designs. This is because, in this price range, manufacturers often design their cabinets and baffles around their hardware, enabling the speaker to reach its fullest potential. This price range is home to some of the best made speakers too, with advanced joints, bracing, dampening and materials. Ultimately, they look and feel worth the high mid-range price. It goes without saying that when shopping for speakers, you should consider the type of music you are working on and the size of your studio. For example, if you don’t often work with super low frequencies in your music or if you have a small studio, chances are a compact monitor will be a better option for you than a larger one. On the other hand, if you are working on electronic music, hip hop, or any style where 808s and deep bass lines are the norm, having that larger cone for a bigger bass punch is a must. At the end of the day, $500 in your pocket gives you a lot of choice! This is a great range for enthusiast producers looking for a step up in terms of quality, performance and reliability for use in a working studio environment. Ultimately, a sub-$500 speaker should last you a long, long time. Needless to say, take your time when choosing your speaker – while $500 is not a lifechanging amount, it’s still a considerable chunk of cash. Read reviews, watch videos and try to hear some audio samples of your speaker shortlist before taking the plunge. Good luck!